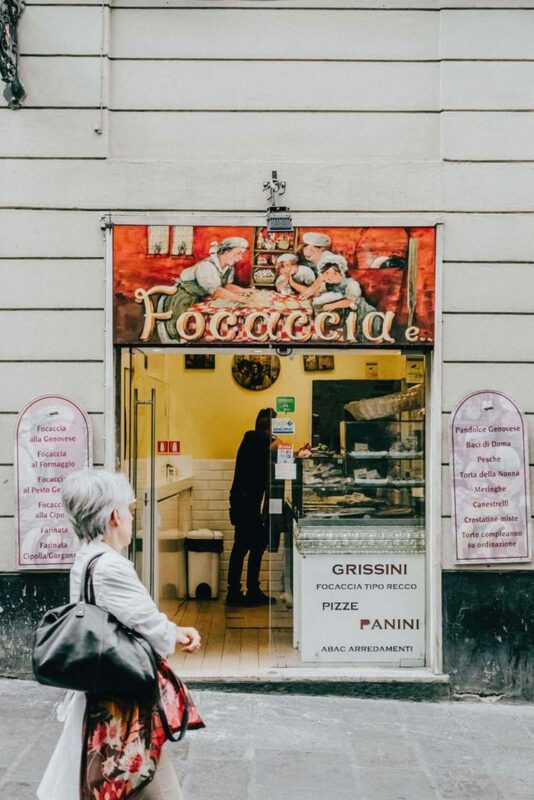 It’s easy to get lost wandering the maze of charming streets in Genoa, but your biggest challenge will be navigating the mouthwatering cuisine of this splendorous city in Northwest Italy. 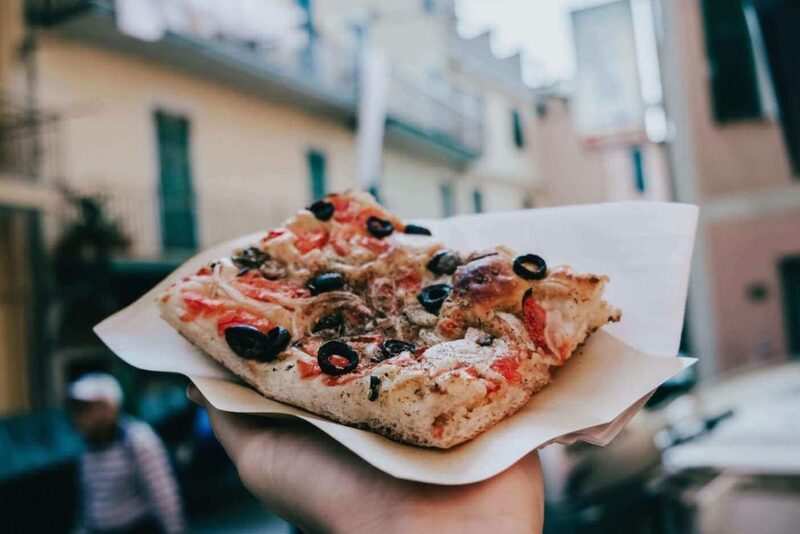 We all know (and love) pizza, pasta and gelato, and, of course, Italy is, the place to sample those heavenly delights, but the region has much more to offer. Whether you’re travelling on a budget or you are simply hungry for an authentic taste of Italy (literally), there’s plenty to sink your teeth into. Here’s my experience with the beautiful country’s incredibly delicious cuisine. All photos by Annie Kruntcheva. Espresso culture is undeniably Italian. And let me tell you, all the rumours of this cornerstone of Italian life I had heard prior to my trip were confirmed by my first few visits to Genoa’s cafés. 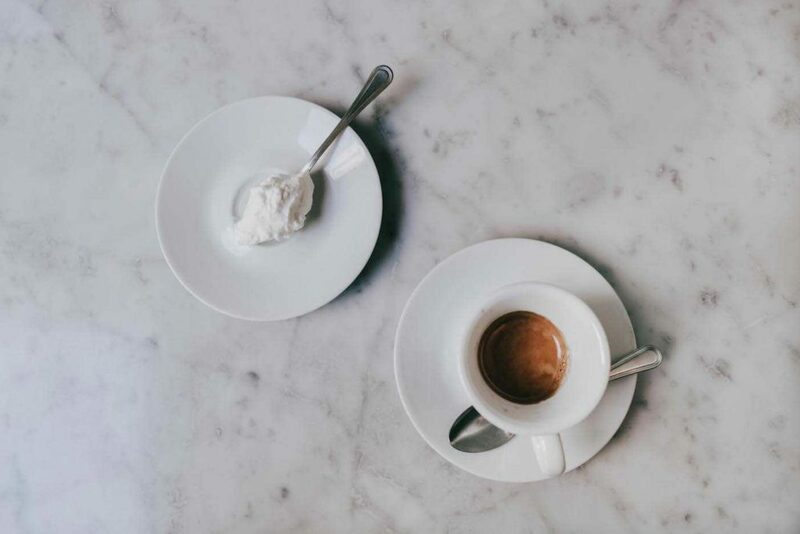 In fact, my very first sip of espresso couldn’t have been more quintessentially Italian: sitting on a bustling Genoan street, my teeny shot of espresso was served with a dollop of freshly whipped cream to the sound of a local busker filling the morning air with sweet, Italian melodies. The espresso shots are, however, tiny, so two sips later I was already on my way. In need of more sustenance, I visited another teeny café located in a vibrantly coloured building just next door. I was greeted with an exceptionally enthusiastic ​‘ciao!’ that quickly gave way to a constant stream of ​‘arrivedercis!’ and ​‘buongiornos!’ awarded to other customers. Before I knew it, an espresso was in my hands. You can ask to have the shot topped with whipped cream, or, like most Italians, you can add a spoonful of sugar and chug the lot. Anxious to escape the hustle of the café, I quickly downed a custard-filled croissant, getting icing pretty much everywhere, and made my exit. It seems that the average Italian spends no more than a couple of minutes in such establishments, which generally don’t have seating available. Accordingly, I took my leave to a resounding ​‘grazie!’ from the proprietor. Coffee is generally crazy cheap (even at airports), with espressos costing about €1 and any ​“longer” styles of coffee (americanos, lattes and cappuccinos) coming in at around €1.50. A tip for coffee lovers: don’t order a latte thinking you’ll get a coffee. Latte literally means ​‘milk’ in Italian, so unless you want a refreshing glass of milk, ask for a ​‘latte macchiato’ or a ​‘cafe latte’. As I have a quite the sweet tooth, I salivated even at the mere thought of the pastries, cakes and biscuits awaiting me in Genoa. To get your fill, look for one of the ever-present Pasticcerias, which are basically Italian pastry shops. From amaretti to tiramisu to biscotti to delicious pies, cakes and croissants, these places are heaven if you’re craving something sweet. My favourites, however, have to be cannoli and sfogliatelle. 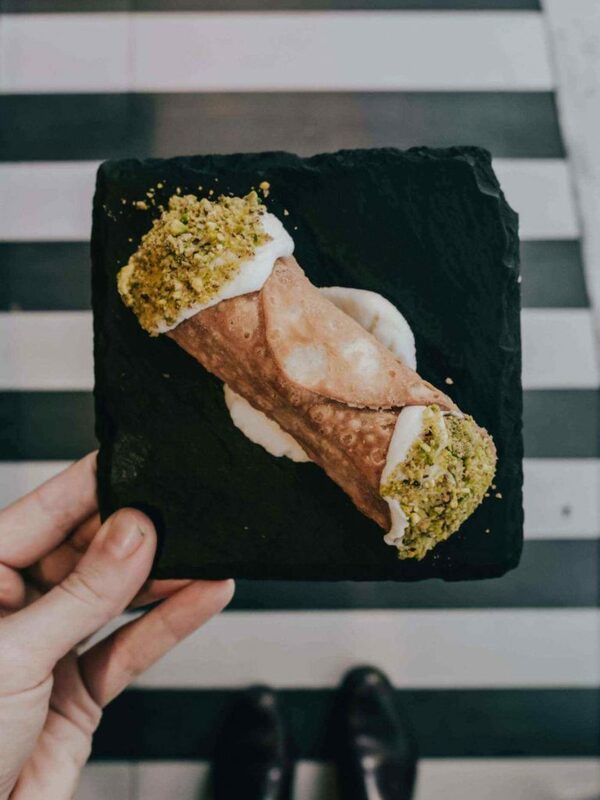 A cannolo (plural: cannoli) is a crunchy, tubular biscuit filled with fresh, sweetened ricotta cheese and dipped at the exposed ends in either chocolate shavings, candied orange peel or crushed pistachios. 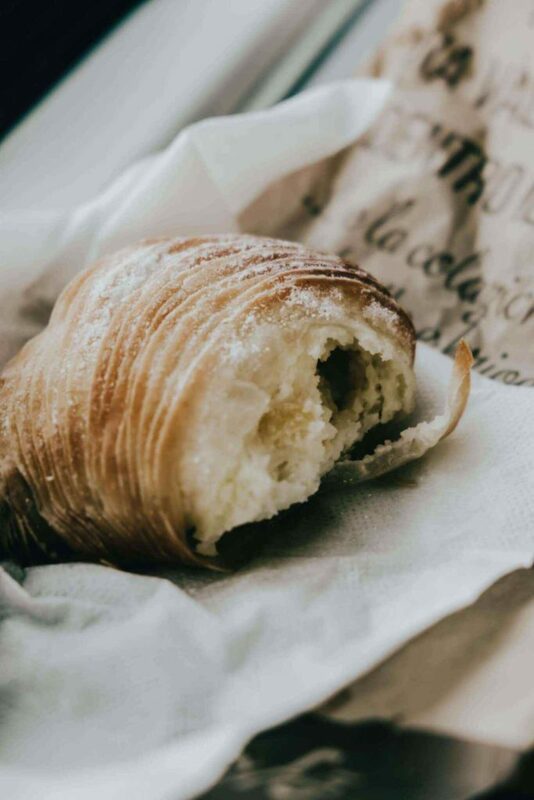 A sfogliatella (plural: sfogliatelle) is a pastry ​‘shell’ which resembles a lobster tail and is layered with leaves of thin, crisp pastry and filled with smooth chocolate or fresh ricotta. The ricotta is often flavoured with lemon or candied citrus peel. Both pastries are a small, yet just the right size to satisfy a sweet craving or to enjoy alongside an espresso. You’ve heard of Pasticcerias, now get ready for Focacciarias: bakeries dedicated to focaccias, though pizza and various panini sandwiches are also to be found in these shops. Focaccia is a fairly flat Italian bread with a spongey, cake-like texture, topped with a variety of savoury garnishes. Common toppings include parmesan, pesto, olives, capers, tomatoes, onions and plenty more. On a trip to Cinque Terre from Genoa, a beautiful national park featuring five stunning seaside towns, I had a divine slice of warm focaccia with olives, capers, tiny slivers of anchovies, a little fresh tomato and onion. 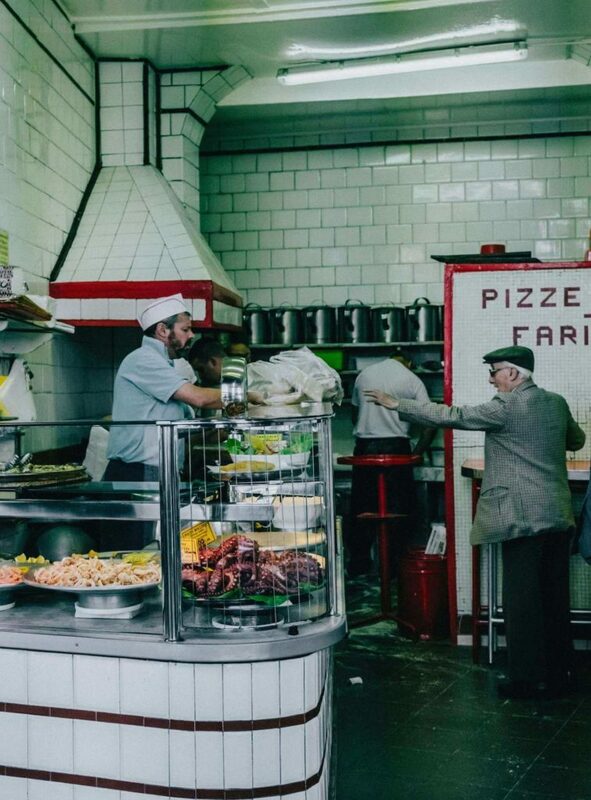 At between one and three euros, a slice of focaccia is a budget traveller’s best friend. 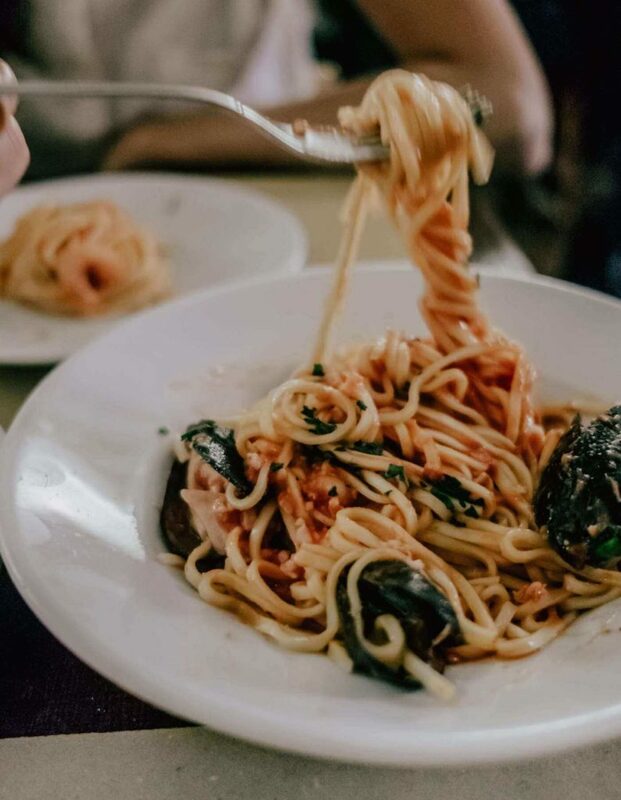 Italians may be renowned for their pasta but beware of dodgy dishes: although thought of as simple foods, restaurants do sometimes take tourists for a ride when it comes to these crowd-pleasers. I recommend doing your homework beforehand to find a good ristorante or trattoria serving fresh pasta (or at least a decent dried one). Apropos, a trattoria is an Italian eatery less formal than your average ristorante. After a highly disappointing first Spaghetti Frutti di Mare (spaghetti with seafood) on my first night in Genoa, I scoured my sources to make sure my next pasta venture was up to snuff. Luckily, the effort paid off and I had the most fantastic Spaghetti Frutti di Mare (with mussels, shrimp and calamari) and a delightful pasta called Trofie. 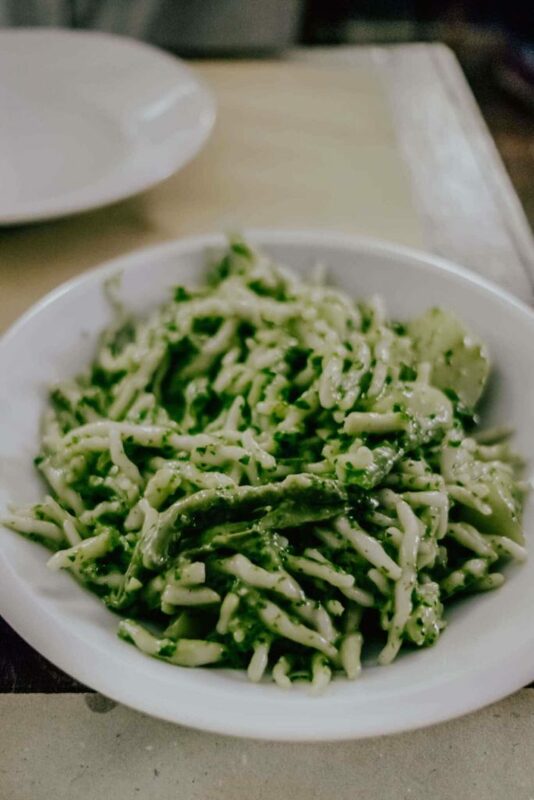 The Trofie al Pesto is a common dish in the Liguria region of Italy and consists of pasta mixed with chunks of potato (strange, I know) and a rich basil pesto. A good bowl of pasta doesn’t have to be expensive either. In fact, the worst bowls I had were the ones over twelve euros. In Cavour 21, the exceptional and locally renowned ristorante I went to in Genoa, most pasta dishes were only around six or seven euros. Another tip. If you’re surrounded by tourists in a restaurant: run. If you can’t read the menu (and it’s all in Italian), you’re in the right place. Genoa and Cinque Terre are both situated by the sea, so naturally, seafood is a MUST. Fishing villages are dotted along the coast of Italy and the north-west is no exception. Genoa has its own port and sees loads of fresh seafood come in every day, so there’s ample opportunity to catch a world-class dish in the city. If you’re interested in exploring some of the smaller fishing towns nearby, especially if you don’t have time to see Cinque Terre, head to Boccadasse for beautiful views and a Cinque Terre-style experience. 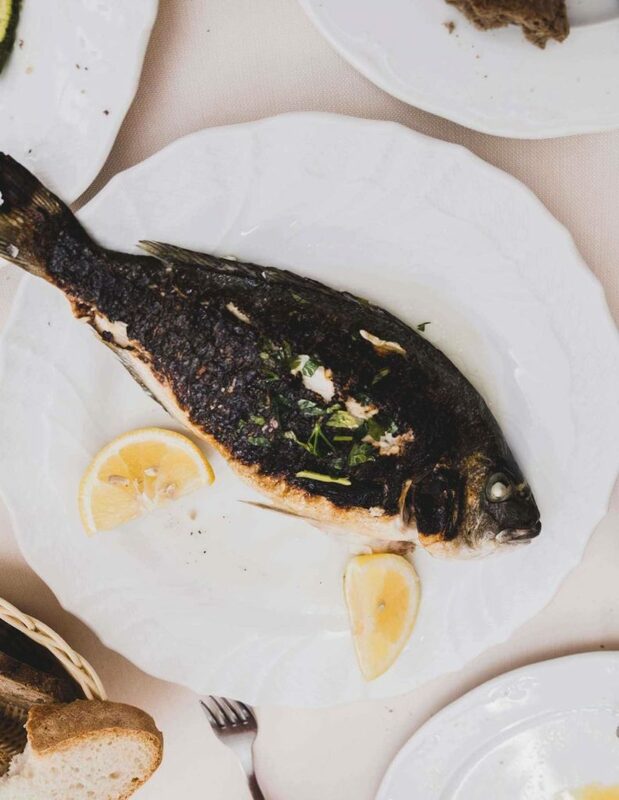 As for sampling the seafood, I recommend going for fresh fish from the grill, even though plates of fried seafood such as calamari, mussels, sardines and octopus are more popular with the locals. For the best fried seafood in Genoa, head down to the waterfront and dig in at hotspot Antica Friggitoria Carega. Grab a plate, have a seat and watch the chefs in action. As you might have guessed from the name, pesto alla Genovese was invented in Genoa, and so, it’s an obvious must-try when visiting the city. The pesto is made from fresh basil leaves, olive oil, garlic, pine nuts and loads of parmesan cheese. You’ll find it on focaccia, pizza, pasta and anywhere else, that might benefit from that extra pinch of pure deliciousness. Gelato is made with a higher proportion of milk to cream than your average ice-cream and is churned at a slower rate too, giving it a thicker, velvety soft texture. I love gelato, and I ate enough in Italy for it to nearly be coming out of my ears. Personally, I have a compulsive tendency to go for pistachio and hazelnut, but really, each and every flavour is beyond delicious. Most Gelaterias only serve the good stuff, so it’s unlikely you’ll get a bad scoop. 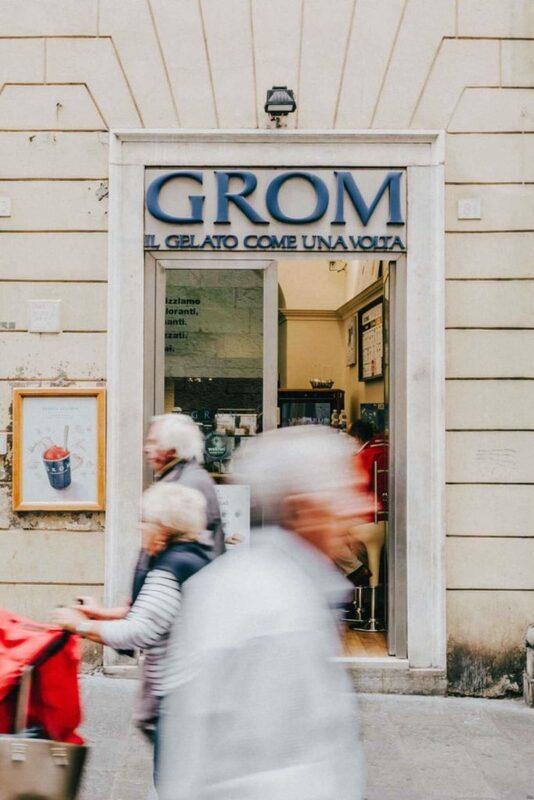 If you trust chain stores more, look for ​‘Grom’: a great gelato chain serving up thick and velvety gelato with the most deliciously intense flavours I’ve ever had in Italy. If you’re visiting Cinque Terre, I urge you to visit the town of Corniglia and the gelato shop by the name of Alberto Gelataria. 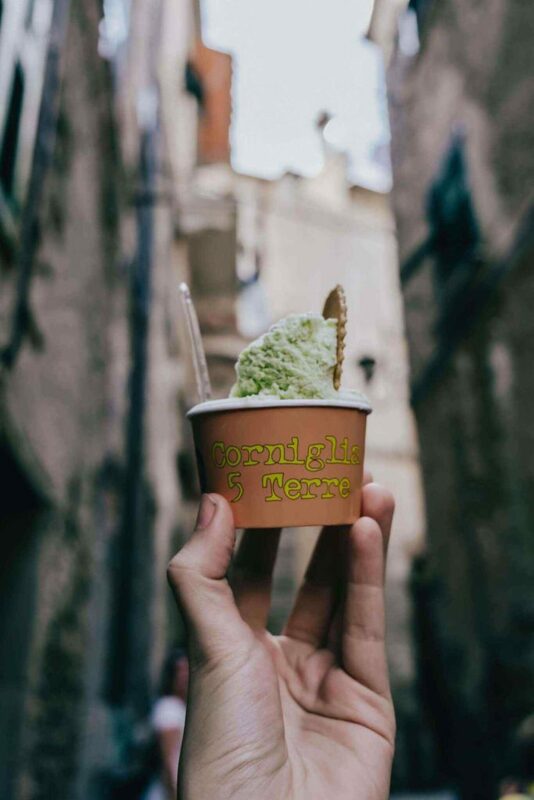 They serve the most tantalising basil gelato made with olive oil and fresh basil from their garden – you won’t regret it. 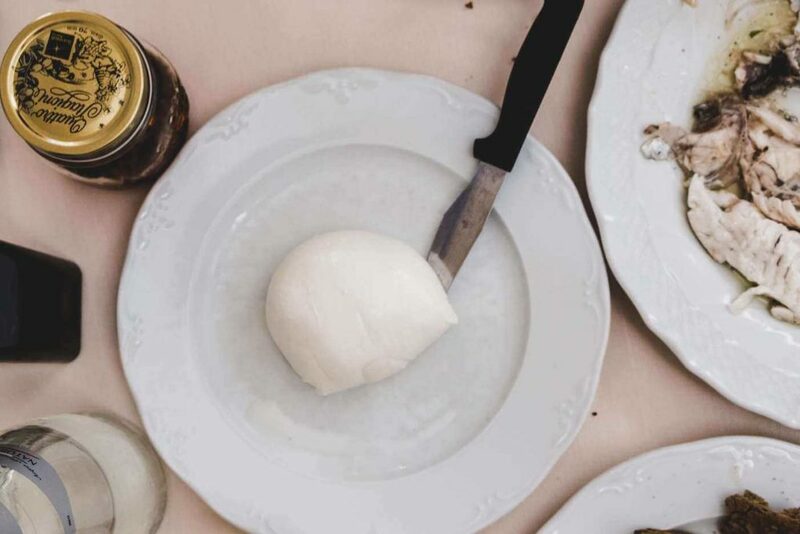 Don’t settle for the rubbery stuff sitting in sad little bags at your local supermarket, when you’ll be able to hunt down the freshest mozzarella with ease during your stay in Italy. If it’s not on the menu, try asking the waiter: they may very well have some tucked away in the kitchen for use in other dishes, but they will happily give you a fresh ball on a plate. During my trip to Cinque Terre, the charismatic and authentically Italian owner of a ristorante gladly served up a ball of fresh buffala mozzarella for a friend and I. It was made fresh that very morning and was perfectly exquisite served with a simple drizzle of extra virgin olive oil and a pinch of coarse sea salt.